Activated charcoal was once considered the “universal anecdote” with a variety of proposed benefits ranging from lowering cholesterol to whitening teeth, and even curing hangovers. It’s black powder form is composed of bone char, coconut shells, peat, petroleum coke, coal, and olive pits. The charcoal is “activated” by processing it at very high temperatures. The high temperatures change its internal structure, reducing the size of its pores and increasing its surface area. But how does it work in the body? Activated charcoal works by acting as a magnet–trapping toxins and chemicals in the gut, preventing their absorption. Whitens Teeth– adsorbs plaque and microscopic tidbits that stain teeth. Activated charcoal use is cost-effective and an all-natural solution for a bright smile. Alleviates Gas & Bloating-Charcoal promotes a healthy digestive tract by removing the toxins that provoke cellular damage. Take 500 milligrams one hour prior to a typical gas-producing meal, with a full glass of water. Follow with an additional glass of water immediately thereafter to help get the charcoal into your system, where it can bind with gas-producing elements. Treats Alcohol Poisoning– Activated charcoal does not adsorb alcohol, it does help quickly remove other toxins from the body that contribute to poisoning. Alcohol is rarely consumed in its pure form; mixers that include artificial sweeteners and chemicals are common. 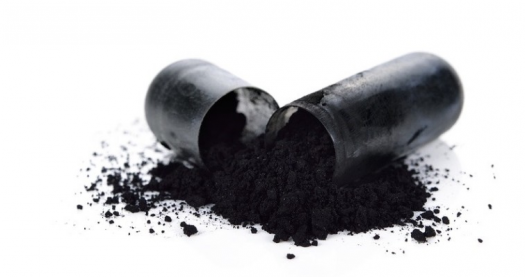 Activated charcoal treats poisoning by removing these toxins. Mold Cleansing-most people don’t think mold can live in their bodies, but it can. Toxic mold causes depression, kidney failure, decreased brain failure, headaches. A dose of charcoal will cleanse the system of mold to increase energy and mental clarity. Anti Aging-helps to prevent cellular damage by supporting the adrenal glands. Aging is a natural part of life, but due to the toxic load we are exposed to through environment, food, and pollution, we speed up the process. Reduce High Cholesterol– has been proven to reduce LDL choesterol 41% in a matter of 3 weeks.